Skiathos is the most popular of the Sporades, the islands to the east of Volos and north of Evia. It has much to offer people of all ages and nationalities most of whom find themselves returning year after year. The island is actually the extension of the wooded Mount Pelion and the scenery reflects this. 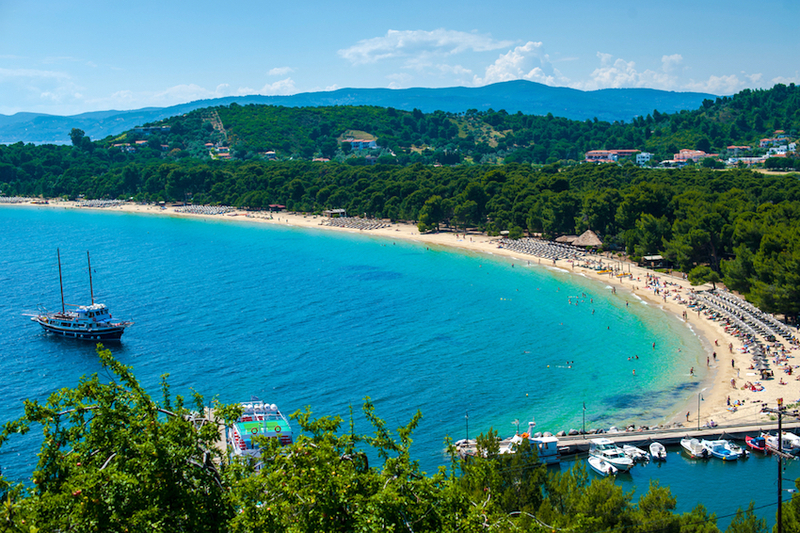 Skiathos is a green island with forests and abundant water. There are fig, olive, plum, and almond trees as well as grapes. Lately the success of the movie Mamma Mia has created a sort of mass-hysteria as people who loved the movie come here and to the neighboring island of Skopelos, looking for the island depicted in the film. They may never find those scenes they were looking for but nevertheless people visiting Skiathos should not be disappointed. It is a beautiful island and really the only criticism of it, which many of the Mamma Mia cultists will soon discover, is the difficulty in getting here. It is almost as if they don't want tourists to come. For some that is all the more reason to go. But you won't find an unspoiled, remote island stuck in some sixties or seventies time-warp. Skiathos embraced tourism many years ago and on some of the best beaches and wooded hillsides you will find some of the finest hotels in Greece, and in July and August you may have trouble finding a room if you don't book early. There are over 60 beaches in Skiathos, all sandy including Koukounaries (above photo) rated 7th best beach in the world and best in Greece. Also Banana Beach just around the headland is the island's only Naturist Beach and is fantastic and very sheltered. Most of the beaches are easy to get to by bus or moped as they are mostly found on the only main road on the Island. There are all types of water sports available at most of the beaches and even a diving center. As a rule, the closer you are to town the busier the beach will be. The iconic Lalaria Beach which is accessable by excursion boat is known to lovers of Greece through the EOT posters from the seventies which used the white pebbles and turquoise waters to lure generations of tourists to Greece in the same way that Shipwreck Beach on Zakynthos does now. But unlike Zakynthos there is no rusty hulk rotting on the beach, just sand and sea. OK. pebbles and sand. 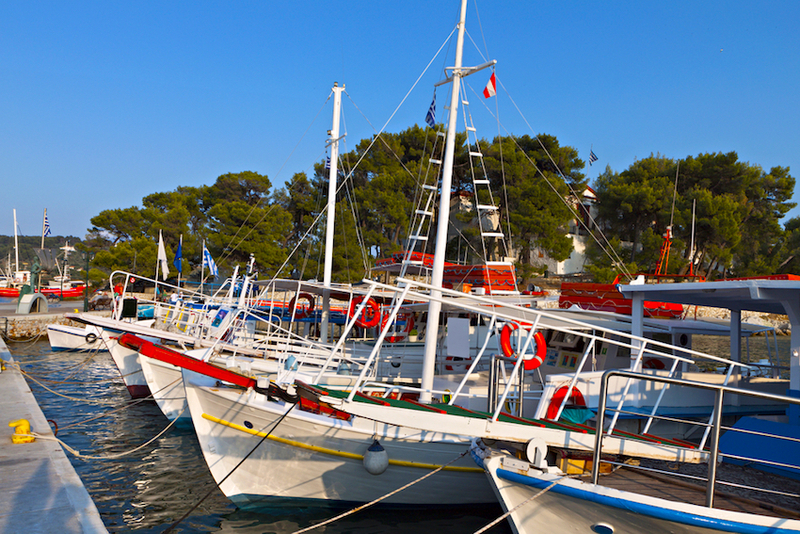 You catch the boat from the harbor in Skiathos town. It can get crowded in the summer and there is no shade so bring your own. You may want to bring water too. If you come early you may have the beach to yourself but probably not for long. There are a number of private boat tours, some on sailboats, so rather than go to Lalaria and be dropped off find the tour that goes around the island with a stop there. Walking in Skiathos is wonderful. The green and mountainous interior are worth all the effort. Check out Kounistras Monastery in the hills behind Troulos for a cooling mid day drink and simple food. A lady called Roula takes care of the place. She is very poor and lives only on what she makes from the sale of candles so give what you can. 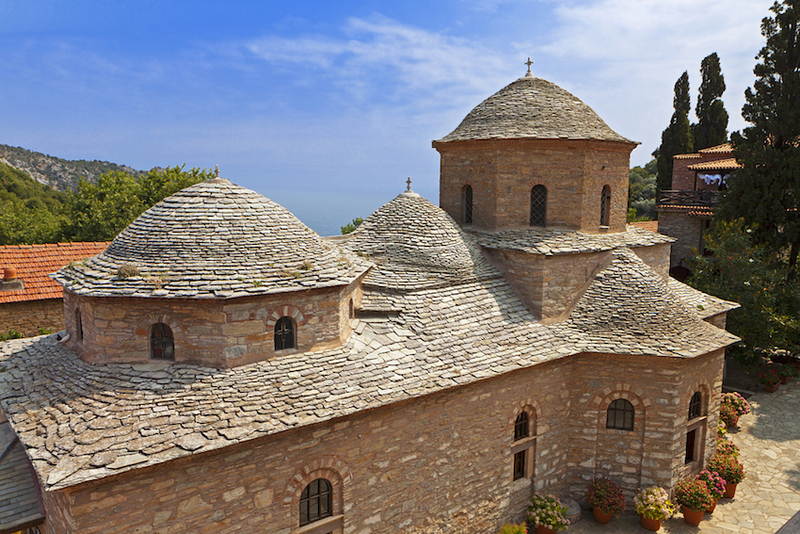 Also worth seeing are the ruins of Kastro which can be reached by excursion boats, and the Evangelistria Monastery (photo), a haven for revolutionaries during the war for Independence against the Turks. It is said that the first Greek flag was flown here. It is located among pine and cyprus trees in a beautiful and dramatic setting and can be walked to from town if you are of reasonably good health. Skiathos Town is the place to eat and to be seen eating. The beautiful people meet up here, have a meal in one of the harbour-side restaurants and just pass the time over wine and cocktails. Friday and Saturday nights are best after 10pm. In the words of the Lonely Planet Guide "Most people come to Skiathos for the beaches and the nightlife-if you have come for anything else you may want to depart quickly". While this is true in late July and all of August, the warm months of May, June, September and October are fine times to visit and even in the cooler months the town is hardly deserted because of the number of foreigners living here. As for nightlife Skiathos has plenty of it especially in July and August when the island becomes the Mykonos of the Sporades. 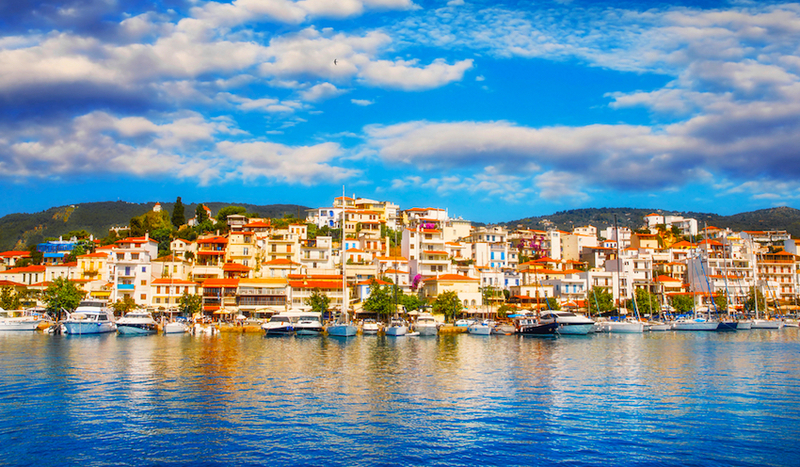 By day Skiathos has it's share of tourist and postcard shops, travel agents, bars, motorcycle rental agencies and hotels. Because there is a decent sized year round population in Skiathos there are a number of restaurants that cater to the locals. Not that they don't cater to the tourists as well. It would be silly not to. But like many islands the best food can be found at the restaurants that are open year round and not necessarily in the high-rent locations on the waterfront. Try Taverna Varthalami just behind the harbour for a real family owned Greek Taverna that wants to stay that way, with low prices, fresh fish and lots of meat and oven dishes. The grilled sardines are recommended as are the Paidaikia (lamb chops) and Hirino Brizola (Pork Chop). Nikos and his family are known for their hospitality and the restaurant is popular with locals and people who return to Skiathos for their summer holidays year after year. Also recommended for similar reasons is Taverna Messogia in the back streets for another real Greek taverna with character that is popular with locals and travelers as well. Try their Kouneli Stifado (Rabbit Stew) and Lamb Kleftiko. Agnadio on the road to the Evangelistria Monastery has a great view, a friendly staff and excellent traditional Greek/Mediterranean food. A taxi there will cost about 5 euros. It appears to be slighlty upscale but prices are actually very reasonable. 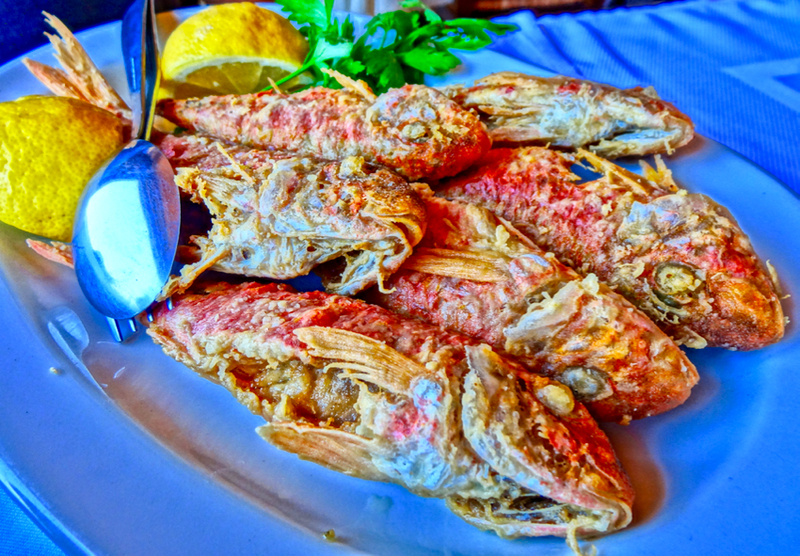 Try the Seabream with Mashed Potatoes and Peppers or the Shrimp Saganaki Risoto or ask what the chef recommends. Kabourelias is an ouzerie that has been there forever, featuring an excellent tsipouro kai mezedes, and fish from the local fishermen and O'Batis is on the cliff just above the harbor, featuring freshly made specialties of the day. Both are open for locals all winter. Hellinikon features home cooking by Mama, great atmosphere and Maria's lively personality. Marmita is an excellent restaurant in the heart of the village, featuring amazingly delicious neo Greek cuisine. To Manovaki is a streetside taverna run lovingly and well by a young local man, mostly his mother and grandmother's recepies, side street by the Mouria restaurant and hotel. The Windmill is known for its excellent food, the spectacular views and the fact that it really is a windmill. Avli's in Ag.Paraskevi has great home cooked food at very reasonable prices, especially the orange pie. Sklithri which is right on Sklithri Beach has great seafood. Stathi/lia's is home to the old time x-pat residents of Kanapitsa who also go to Kanapitsa Taverna. The most popular taverna that is open all year is Bakaliko. The town is also full of souvlaki shops, fast food shops, and cafes with food too. People say No Name gyro and souvlaki shop is not just the best on Skiathos but one of the best in Greece. For self-caterers there are plenty of shops to buy everything you need to spend your evenings staring at each other while everyone else is having fun in the tavernas. Getting around is very easy. The bus runs the length of the main road every 20 minutes in the summer. Moped and Scooters are easy to hire from the town (make sure you get Full Insurance). There are excursion boats leaving from the old harbor to Lalaria, one of the most photographed beaches in Greece, and the caves of Galatzia, Halikini, and Skotini which can only be reached by boat. Car Hire is also available and you can even rent a jeep for off-roading. Most likely there will be cards and brochures at your hotel advertising a car rental agency but if there isn't you can just ask. If you are beginning and ending your trip in Athens you might consider renting a car there and driving to Agios Konstantinos for the ferry. For car rentals see Fantasy Travel Rent-a-Car and Swift Rent-a-Car. Rooms are relatively easy to find especially in the town except in the months of July and August when the island is busy and it is best to have a reservation and have it booked well in advance. If you book your August holiday in mid-July the pickings will be slim if you find anything. 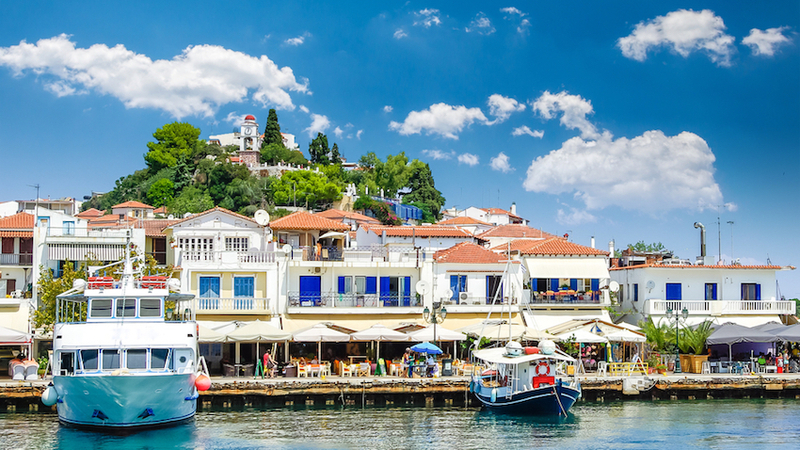 The coast of Skiathos is lined with resorts, hotels and villas and you can expect to pay considerably more for a room during the peak summer months. The best time to come is in the off season when finding a room is easier and cheaper. May, June and September are excellent months to be on Skiathos. Booking through a reliable travel agency in Athens is a good idea because of the assistance you get for coordinating buses, taxis and ferries or flights to get to the island plus in most cases you will need a hotel in Athens for the first or last nights of your trip, if not both. For travel agencies who can book hotels in Skiathos I recommend Dolphin Hellas and Aegean Thesaurus Travel. Among the most popular hotels in Skiathos is the 4-Star Bourtzi Boutique Hotel with its spacious and carefully designed rooms and suites just a few minutes away from the harbour, in the heart of Skiathos. This hotel has free wireless, a pool, and soundproofed rooms for total rest and relaxation. Those looking to take it a step higher can stay in the Aegean Suites Hotel, a luxury hotel for adults and families with children aged 14 years and above. Built on the hill overlooking the sandy beach of Megali Ammos, these are traditional style buildings combined with contemporary Mediterranean chic and an exclusive atmosphere. The large swimming pool is framed by tall green palms, white umbrellas and wooden sun loungers, where you can sip champagne or exotic fruit cocktails. Likewise the 5-Star Skiathos Princess (photo) is on the beach of Agia Paraskevi, surrounded by gardens andoffers direct access to the white sandy beach. There are also 3 restaurants, 3 bars, and clubs and activities for children and of course a swimming pool. Kanapitsa Mare Hotel & Spa offers modern, luxurious rooms, deluxe rooms, superior deluxe rooms and suites, overlooking the Aegean and the town of Skiathos. All rooms feature modern furniture, great sea view, FREE Internet access, satellite TV, safe deposit box, direct dial telephone, a/c, access to the Spa Center. Also check out the Villa Zorbathes, owned by Lida and Geoff Baldry, a great place to stay for groups, honeymooners, friends or families. The Villa is highly recommended by all the people who stay here and Lida and Geoff will make sure you feel right at home. By popular demand they have added a beautiful swimming pool. Lida and Geoff can also help you get information on getting to and from Skiathos and introduce you to some of the large expatriot community on the island. They are also super hosts and can help you with information on the best tavernas, beaches and secret places so that by the time you leave you will know more of Skiathos than the ordinary tourist and maybe as much as some of the residents. There are also camp sites at Koukounaries beach, Megali Aselinos beach, Kolios beach and Xanemos Beach near the airport. Of the four Koukounaries is the most highly recommended. Planes from Athens fly daily and relatively cheap but seem to leave and return at strange hours. You can also get there by Ferry from Volos or Agios Constantinos or by Charter Flight from many cities around Europe. There are numerous highspeed boats from Volos and Agios Constantinos on the mainland and several a week to and from Thessaloniki, as well as daily connections to other nearby islands in the Sporades chain though usually just in the high season summer months. 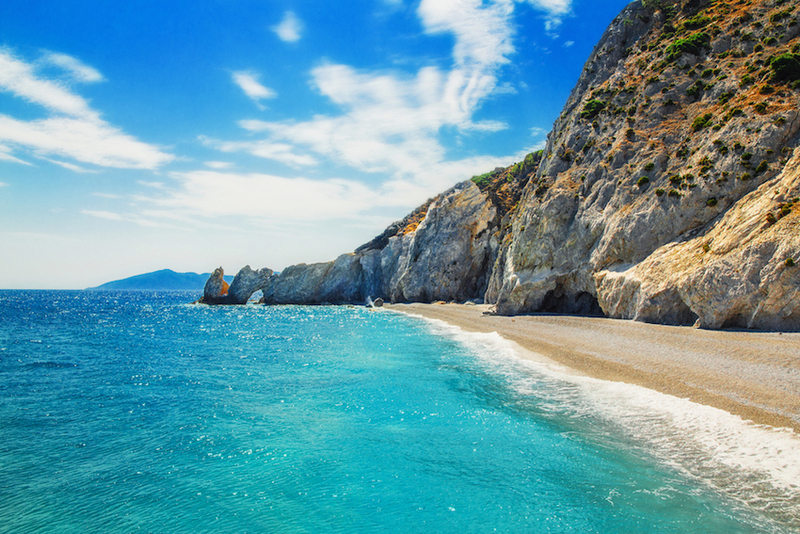 Check out Skopelos and Allonisos. These are easy to reach by ferry but be aware that, because of the timings, you may not be able to return the same day so take an over night bag. How to get to Agios Constantinos to catch the boat seems to be the most common query I get for Skiathos. You can take the X93 bus from the Athens Airport to the Terminal B Bus Station. (It was E93 but then it became X93 so whether it is E or X, take the 93). You can see Terminal B Bus Schedules but always take any schedule you see with a grain of salt, especially these which have not been updated since the Greek National Tourist Organization stopped printing them out for the tourists. Local people and those who go to Skiathos every summer go to Alkon Travel on the corner of Kanigos Square (97 Akademias Street) for a special bus that connects with theferry at Aghios Konstantinos usually at around 7am, but it depends on the ferry schedules. Most people and particularly families who don't relish the thought of two buses and a ferry, take a taxi from the airport to Agios Constantinos. Contact George the Famous Taxi driver through his websitefor prices. As for the ferry schedules and ticket information I recommend Ferryhopper.com as the easiest to use and the most up-to-date information. If you are planning to rent a car and drive from Athens to Skiathos check out Swift Rent-a-Car . They will pick you up at the airport or your hotel and drive you to the National road and let you by-pass the notorious Athens traffic. For transportation and hotels and more information about a holiday in Skiathos contact Dolphin Hellas and Aegean Thesaurus Travel. If you want to combine Skiathos with other islands or the Greek mainland and Athens and need assistance try my Create-an-itinerary form and if nothing else the agency can tell you if what you want to do is even possible. For a couple very nice packages which feature Skiathos, Skopelos and Alonissos take a look at those offered by Aegean Thesaurus: The 7 Day Sporades Program and the 14 Day Sporades Program. A special thanks to Fantasy Travel for the photos on this page which they actually got through DepositPhotos.com.